Leave your cruise ship behind at the Port of Dubai and head out to see the city highlights on a private 4.5-hour sightseeing tour! While enjoying personalized attention from a private guide, see top Dubai attractions such as Burj Al Arab, one of the worlds tallest hotels. Explore the neighborhood of Jumeirah, and then visit Dubai Museum at the Old Al Fahidi Fort. Before returning to port, travel by traditional water taxi to two legendary Dubai markets: Dubai Spice Souk and the Gold Souk. Meet your guide at the Port of Dubai, and then hop aboard your private, air-conditioned minivan to explore the city. As you travel, your guide will keep you entertained with fun facts and trivia about the city and its countless sights. Relax while traveling through town, passing Dubais glitzy skyscrapers on the way to Jumeirah Beach. Stop to admire the sail-shaped Burj Al Arab hotel, one of the tallest hotels in the world at 1,053 feet (321 meters), and then continue traveling to the upmarket neighborhood of Jumeirah. Stop for a stroll with your guide, wandering along the winding lanes and hidden courtyards that typify the area, and see the dazzling Jumeirah Mosque with the integrate design of the dome and pretty minarets. Back in your minivan, head to the historical Bastakiya quarter to visit Old Al Fahidi Fort. Once an 18th-century fort, the monument is now home to Dubai Museum. Head inside and see city models that depict Dubai in the days before the affluent discovery of oil. Pose for photos next to traditional Arab houses, mosques and souks, and learn about the culture changes in the city that have taken place over the last few centuries. Next, hop aboard an abra and cross Dubai Creek to Deira. On this side of Dubai Creek, which is Dubai's central waterway, follow your guide to Dubai Spice Souk to soak up the colors and perfumes of the city. After browsing the wares, continue to the legendary Gold Souk to shop for shimmering souvenirs. 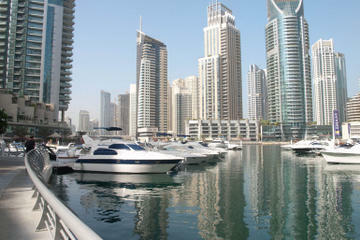 Your cruise excursion then finishes with a drop-off at the Port of Dubai.